Villafranca Del Bierzo become an important tourist centre for the pilgrims going to Santiago de Compostela. Villafranca Del Bierzo is located in the region of Castile y Leon in northern Spain, and is the last significant town that is crossed by the pilgrims on route to Santiago de Compostela. The pilgrimage to Santiago has been in existence for thousands of years since the discovery that Apostle St James remains were buried there. Even today pilgrims from all over Europe walk hundreds of kilometres to reach this sacred destination. As a consequence Villafranca de Bierzo has become a very important tourist centre. Anyone can take part in the pilgrimage, even if you are not religious, and the route can be done either on foot, bike or horseback. 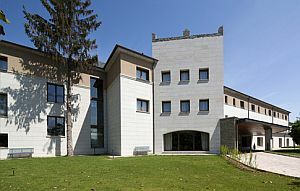 One of the most popular hotels, whether you are a pilgrim or just a visitor, is the Parador Villafranca del Bierzo. This excellent four star accommodation offers a relaxing setting, with scenic views of the mountains and wonderful regional cuisine. There were two ways to enter Villafranca de Bierzo. Either through the Puerta del Perdon gate or the main entrance next to the 12th-century Romanesque Church where pilgrims who were too ill to complete the pilgrimage were given a jubilee blessing. Over the centuries Villafranca del Bierzo had been gifted to various relatives of the King and because of its importance several noble families came to settle here building beautiful mansions and palaces. Because of its rich architectural heritage the town has therefore been declared a Property of Cultural Interest. The Calle del Agua is where you will find the finest examples of these magnificent buildings, however the palace of the Marquises of Villafranca is located near the main entrance. As an added point of interest, one of the homes along this street is the birthplace of Gil y Carrasco, a Spanish author. The Plaza Mayor is one of the town's most attractive squares and where the City Hall is located. Other buildings of historical interest are the four convents; Agustinas Recoletas, San Nicolas el Real, La Anunciada, and San Jose. Beyond Villafranca del Bierzo there are the ancient Celtic huts of O’Cebreiro and the La Medulas Gold mines. To the east is the city of Leon, which dates back to 68AD and has one of the finest Cathedrals in Europe. As well as places of interest there are also a variety of outdoor pursuits to enjoy in the area and include hiking, biking, fishing, canoeing, and swimming. 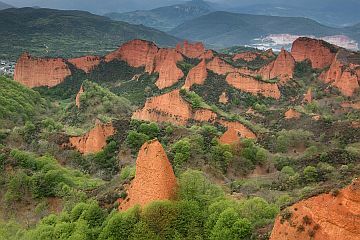 Many visitors make the journey to the Picos de Europe as well, which is approximately 50 miles north of Villafranca del Bierzo. This stunning nature park is one of the few remaining habitats of the brown bear and wolf, and also has some of the country’s deepest caves. If you wish to try something a bit different, La Robla Express is a marvellous way to see northern Spain. This is a period train offering a bit of glamour with a very classic decor combined with modern facilities. On route the train stops at various points along the way giving you a chance to explore the more notable places of interest. Its enormous windows enable you to get a marvellous view of the scenery, and as the shortest journey is two days and one night there are also sleeping cars provided. Other facilities on the train include a permanent bar service, library, internet access, and a free breakfast buffet. So should you decide to break up your stay with a couple of days away, this would definitely add a unique element to your holiday.